Milky Way Clouds on Acros, a photo by S Migol on Flickr. 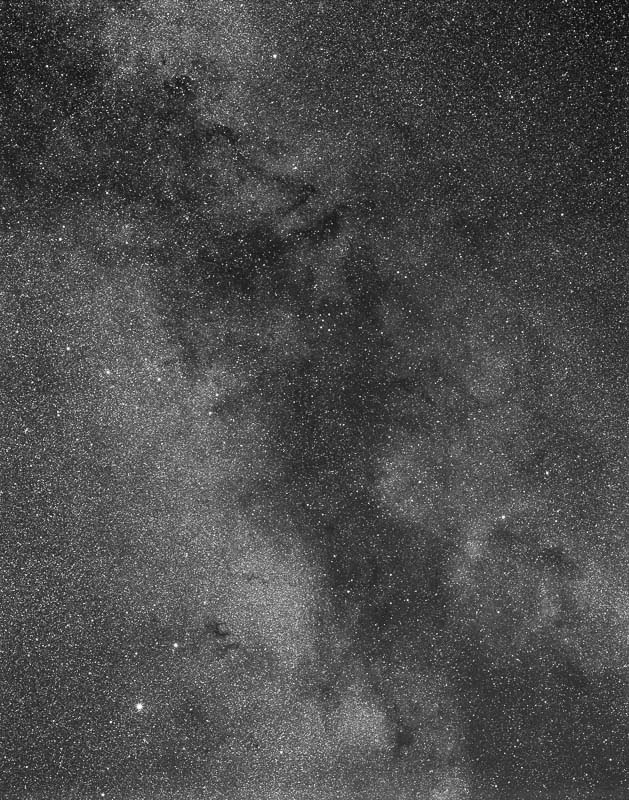 A widefield image taken at Calstar 2013 showing the dark clouds of the Milky Way from Aquila to Lyra. The Triple Cave nebula and M27 are visible as well as many of the dark lanes in this part of the sky. Shot on Acros 120 film with a Pentax 67 camera using the SMC Pentax 6X7 165mm f/2.8 lens at F4 with a Y2 filter to increase contrast. 40 minute exposure - don't remember if there was a push. Scanned with Epson V700 and curves in LR5. There is a gradient from south to north that comes from the glow on the horizon. I could fix it a little, but I'm not sure that this is all a problem. Note the lens flare near the top of the image from Vega.